Mitsubishi's teaser photo of the Engelberg Tourer concept shows the brand’s trademark split-level headlamps and a bar of safari-style roof lights. 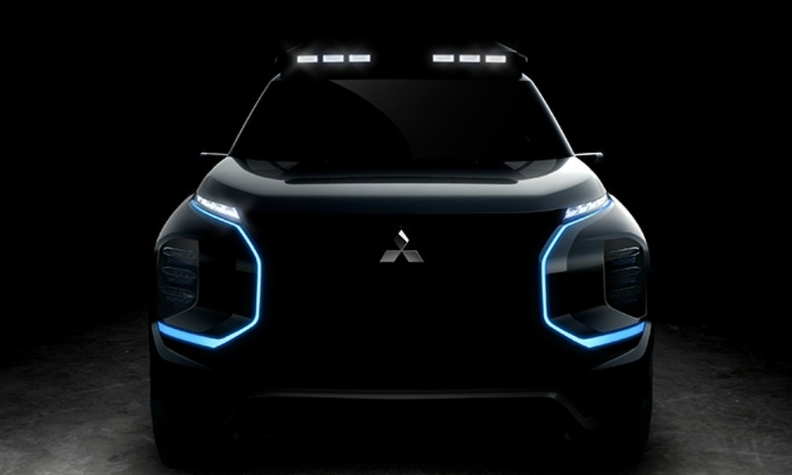 TOKYO – Mitsubishi Motors wants to light up the Geneva auto show with a new concept vehicle it says brings "more SUV, more EV, more technology and more style." It also brings more light. A teaser photo of the vehicle, released on Tuesday, shows the brand's trademark split-level headlamps on the front and a bar of safari-style roof lights up top. Mitsubishi calls the upcoming concept the Engelberg Tourer and says it is named after the Swiss alpine ski resort town. The vehicle underscores Mitsubishi's two top priorities for future product development – a focus on crossovers and more electrified drivetrains. The styling seems to build on the e-Evolution Concept shown at the 2017 Tokyo auto Show with a bold expression of the brand's Dynamic Shield front fascia. Mitsubishi said it will unveil the Engelberg Tourer at the Geneva show on March 5.